Anna Bolton | Greene County News Greene County Engineer Bob Geyer presents the 2019 road and bridge program to the county commissioners Jan. 17. XENIA — Greene County Engineer Bob Geyer presented his last road and bridge program Jan. 17 to the Greene County commissioners, summarizing the just under $9 million report for 2019. Highway maintenance has the highest allocated number on the list at $3 million, which will go toward pavement maintenance material for patching, berming and crown corrections, as well as general highway maintenance, mowing and weeding, snow and ice control, and labor and fringes for highway workers. Geyer noted the $375,000 line item for snow and ice — specifically the material, salt. He said it is the biggest budget item that he doesn’t have control over. “That equates to $50 per ton for 7,500 tons, which is a normal winter, which is what we always bid. But I seriously doubt the way this winter is going that it’s going to be $50 a ton next year,” Geyer said, noting that it’s now $92 per ton, up from the $48 it was last year. Geyer said the bidding process for salt is always a gamble. 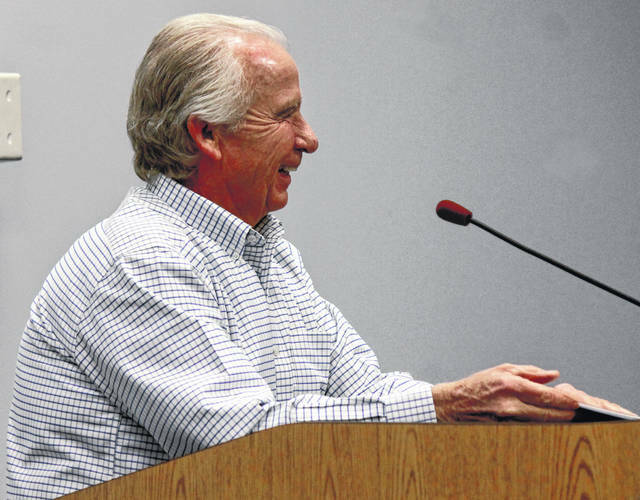 Geyer, who plans to retire in May, added that the cost of salt has increased over the years. He said when he took office 22 years ago, salt was $16 per ton. The second section in the budget includes highway construction for the year. After the $10,000 allocated for guardrail repair, construction by contract adds up to almost $5 million, with the county’s share landing at $2.6 million. Paving 44 miles — including overlay, chip seal and micro-surfacing — will equate to almost $1.9 million. Other projects will include work on a bridge arch on South Street in Cedarville, which may begin in March and last for about 90 days. The county and the City of Fairborn will collaborate on a Dayton Yellow Springs Road improvement and bridge work. A guardrail upgrade project will also be underway around the county. And Wilmington Pike will be resurfaced with the City of Centerville. Those projects all include funding from various grants. Some county bridges will also see maintenance this year for $700,000 — including fixing leaks, painting beam edges and walls, all part of an effort to extend the lives of the bridges. The rest of the budget includes $280,000 for traffic and safety — like signs and striping; $1.1 million for vehicles and equipment; $20,000 for inspection and testing; and another $1.1 million for administration and engineering. Commissioners approved the road and bridge report at the meeting. The full program and maps are available on the county website. https://www.xeniagazette.com/wp-content/uploads/sites/32/2019/01/web1_Geyer.jpgAnna Bolton | Greene County News Greene County Engineer Bob Geyer presents the 2019 road and bridge program to the county commissioners Jan. 17.